Legendary dancer, choreographer, and actor Carmen de Lavallade came to prominence in the early 1950s when black artists came into their own in the world of American dance on Broadway, in film, and on television. De Lavallade was born on March 6, 1931 in Los Angeles, California, to Creole parents from New Orleans, Louisiana. Her father, Leo de Lavallade, was a postman and bricklayer, and her mother, Grace Grenot de Lavallade, was in ill health for most of de Lavallade’s childhood. With sisters Yvonne and Elaine, de Lavallade was situated as the middle daughter. Due to Grace de Lavallade’s illness and subsequent death when de Lavallade was still a teenager, it was her father, Leo, and her aunt, Adele de Lavallade Young, who reared her. Interestingly, Aunt Adele owned the Hugh Gordon Book Shop, one of the first African American bookstores in Los Angeles. An enormous inspiration in de Lavallade’s early life was her cousin, Janet Collins, who became the first full-time African American prima ballerina at the Metropolitan Opera Ballet in New York City, New York. In 1945 at age 14 de Lavallade began ballet training with Melissa Blake, and two years later she won a scholarship to study modern dance with Lester Horton. After joining the Lester Horton Dance Theater in 1949, de Lavallade became its lead dancer in 1951. Besides taking private ballet lessons with Carmelita Maracci, de Lavallade also studied a variety of dance styles, and took acting lessons with Stella Adler. De Lavallade got dancing parts in several Hollywood movies early in her career, including Demetrius and the Gladiators and Carmen Jones. In 1954, after being invited to dance in the Broadway musical House of Flowers by the choreographer for Carmen Jones, Herbert Ross, de Lavallade set off for New York with Alvin Ailey, a friend and classmate at Thomas Jefferson High School in Los Angeles. Another cast member of House of Flowers, dancer and actor Geoffrey Holder, became de Lavallade’s husband in 1955. One of de Lavallade’s signature pieces, Come Sunday, was choreographed with Holder. In 1956 de Lavallade danced at the Metropolitan Opera in Aida and in Samson and Delilah, roles she inherited from her cousin, Janet Collins. That same year de Lavallade made her television debut in John Butler’s ballet Flight. Two months after de Lavallade’s son, Leo Anthony Lamont Holder, was born in 1957, she went back to work. In 1957 de Lavallade danced in a television musical allegory by Duke Ellington, A Drum Is a Woman. In 1958 de Lavallade danced in Alvin Ailey’s evocative Blues Suite, an ode to African American life in the South. The following year she performed with Harry Belafonte in Robert Wise’s film noir, Odds Against Tomorrow. John Butler created the iconic ballet Portrait of Billie for de Lavallade in 1960. Five years later she danced in Agnes de Mille’s productions at the American Ballet Theatre. In 1971 de Lavallade joined the Yale School of Drama as its performer-in-residence and choreographer, eventually becoming a professor there. In the early 1990s de Lavallade returned to the Metropolitan Opera Ballet to choreograph Die Meistersinger and Porgy and Bess. Awards bestowed on de Lavallade have included an Actors’ Equity’s St. Clair Bayfield Award in 1978, the Rosie Award and the Bessie Award, both in 2006, and the Capezio Dance Award in 2007. In 2007 de Lavallade also received an honorary Doctor of Fine Arts from Juilliard. In 2012 de Lavallade was back on Broadway in a revival of A Streetcar Named Desire. Residing in New York City with her husband and collaborator, Geoffrey Holder, after six decades in the performing arts, de Lavallade continues to perform and inspire. “Carmen and Geoffrey: (DVD) Directed by Linda Atkinson and Nick Doob, 2009; William Hageman, “Geoffrey Holder and Carmen de Lavallade, just showing off,” Chicago Tribune, February 13, 2013. 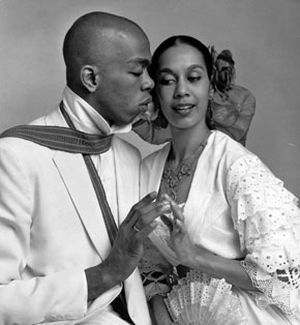 William Hageman, “Geoffrey Holder and Carmen de Lavallade, just showing off,” Chicago Tribune, February 13, 2013.